FBI agent E.J. 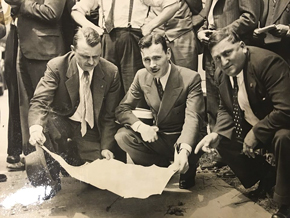 Connelley, center, studies a map of the Parsons estate in the 1930s. Learn about the still-unsolved murder at Huntington Historical Society’s Lunch & Learn. Murder Mystery Over Lunch: The Huntington Historical Society is offering an opportunity to learn some Long Island history over lunch at Mac’s Steakhouse on Gerard Street in Huntington village. During this lunch and learn session, the historical society’s archivist Karen Martin will discuss the mysterious disappearance of New York society matron Alice Parsons. Parsons disappeared on June 9, 1937, and the case has never been solved. The FBI investigated the allegation that Parsons was kidnapped while on her way from the estate in Stony Brook where she lived with her millionaire husband to a family property in Huntington. Parsons’ body was never found, and it is not clear how or if she was kidnapped. Martin will go over the facts of the case during lunch on April 17 from noon-2 p.m. The event includes a three-course meal from Mac’s. For more information visit Huntingtonhistoricalsociety.org. Taste of Long Island: The East Northport Chamber of Commerce is hosting the 16th annual A Taste of Long Island event at The Larkfield (507 Larkfield Road, East Northport). The event features tastings from restaurants, wineries and breweries from across Long Island. Just a few of the restaurants on this year’s list include Café Red, Del Fuego, SUR Argentinian Steakhouse, The Whales Tale Café and Pumpernickles. Attendees will be able to sample drinks from Harbor Head Brewing, Six Harbor Brewing, Po’ Boy Brewery and Fire Island Wines, just to name a few. Hell’s Kitchen and Kitchen Casino Contestant Barret Beyer and Hell’s Kitchen Contestant Chef Frank Bilotti are just two of the celebrity chefs slated to appear at the event. The event runs from 6:30 p.m.- 10:30 p.m., April 18. Tickets cost $75 per person and $85 at the door. All proceeds will benefit Visiting Nurse Service & Hospice of Suffolk, Inc., East Northport Chamber of Commerce, and Rotary Club of East Northport For more information or to buy tickets visit the chamber website at Eastnorthport.com. Free Ice Cream: Don’t feel guilty eating ice cream during Free Cone Day at Ben & Jerry’s (298 Main Street, Huntington). Teachers and principals from the Cold Spring Harbor, Huntington and South Huntington school districts will be scooping out all different flavors for charity. The event runs from noon-10 p.m., April 9, and money raised through donations at the event will benefit the Huntington-based Tri Community Youth Agency. Donations will help fund the organization’s summer program. For more information on the Tri CYA visit Tricya.org.